Nepal is on always our hearts. We eagerly open Facebook to see how our friends are doing– are they still sleeping outside in tents? Are they still afraid? I decided the best way I could be of any help to Nepal is to try to encourage our friends there. I have meager messages to send. It’s not enough. But I want to give something. All 400 of our friends in our shared NGO have been safe since day 1, but I am afraid they will experience burnout. They are giving 100%. They are also feeling the fear 100%. Are they emotionally safe? Can I say anything to encourage them, or are my words trivial? “We distributed 300 insulated mats and 300 tarps in 5 locations around Chiraudi. 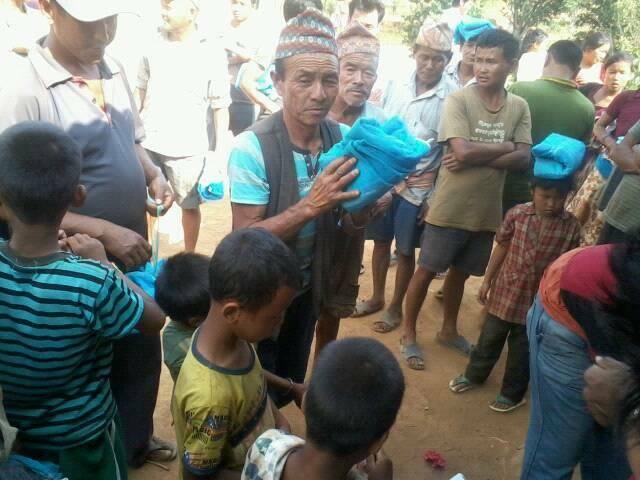 (Then) 1,176 tarps arrived in Gorkha from India and other places in Nepal. Distributed them yesterday (along with bags of rice, insulated sleeping mats and blankets) in several places in the mountains surrounding Gorka…” M.E. “Today reached 123 people without house(s).” K.M. “Distributed for 85 houses…” P.D. Our friends are giving themselves! They are in the best position to be able to give as they speak the language and they already have many connections in the villages most hit by the earthquake and land slides. They are giving food, building temporary shelters for families, helping other bigger NGOs hand out supplies and donations, translating and coordinating within Kathmandu and the epicenter villages. They are phenomenal. I am so proud of our friends in Nepal! 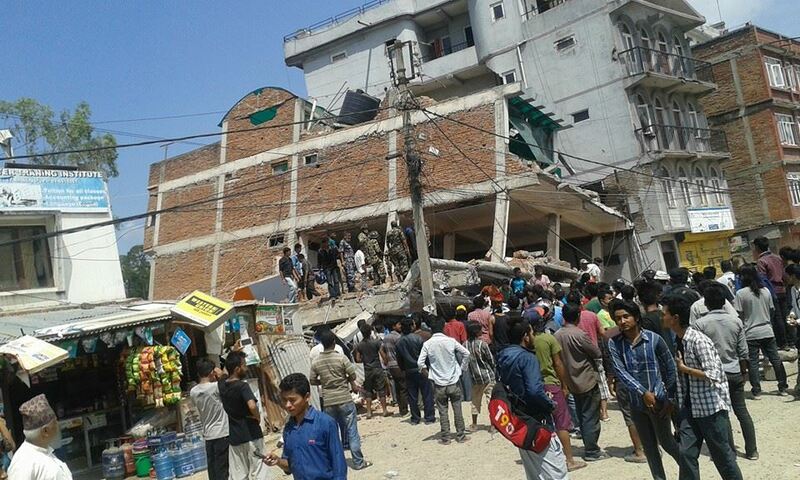 I know the Kathmandu we once knew is now gone. I am hopeful that once the rebuilding begins Nepal will think to the future, not just try to sort out the past. The future is bright for Nepal as the global neighbors lend their helping hands. We are trying to move forward with our life in NZ, renting a house, adjusting, connecting with friends here. I’m not sure how to move forward. I feel emotionally stuck in Nepal, and completely out of my depth in “normal” NZ life. Somehow we have to keep moving forward. ~We are hearing that the funds are no longer bottle-necked in the Nepali government, but going straight through to all the organizations. All I can pray is there will be triumph in Nepal. This crisis will continue and continue and continue…but may there be triumph of the human spirit in the midst of destruction and uncertainty. May the world keep looking to Nepal, keep giving, keep praying and keep hope alive for the nation! Tiger for Breakfast by Michel Peissel reveals how one man, a Russian ballet performer named Boris, birthed Kathmandu and formed Nepal into a tourist nation. It is an incredible story with unbelievable details brought to life. And Boris’ living legacy is the Yak and Yeti Hotel. Read more about the history of the Yak and Yeti by clicking here! A friend and I were walking to lunch when we stumbled on to the remnant of the original Newari wood framed gateway. We wandered into the grand hotel and began asking questions about our friend, Boris. We were pointed here and there and getting no where, until a Nepali man poked his head from over a balcony and asked us if we wanted to come up and see the original building of the Yak and Yeti. Yes! The historical rooms were being cleaned and polished for an upcoming wedding (the grand-daughter of the current owner’s wedding, expecting 2,000 guests!). We had a personal tour of the maze of rooms-including the Queen’s Sitting Room, the Ballrooms, the balconies and the gorgeous original Newari wood carvings. We also saw an antique chandelier, secured behind glass, and several paintings of the Rana kings. The original palace was 140 years old and belonged to the Rana kings. Each king had 10-15 wives and countless children. The marble and mirrors was all imported from Italy. Stepping back into a bit of Kathmandu, Nepal history was the cherry on top of our Kathmandu scramble to renew visas and other errands. Long live Boris! And we are very glad that he helped open the doors to Nepal– he is a providential person in Nepal’s history.